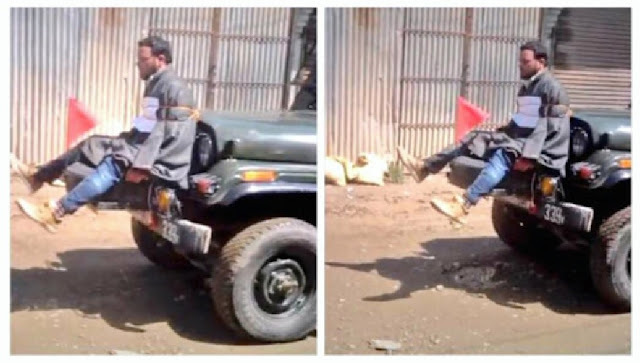 Strangely, human rights 'rudalis' never object when terrorist use Kashmiri youth as human shields. Omar Abdullah is not happy. Why? 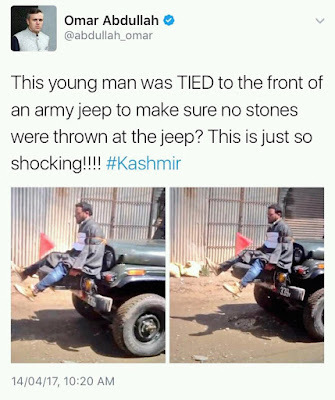 A Kashmiri youth was used by some Indian soldiers to stop the stone pelters. He probably thinks it's degrading. It's a convenient line for him. But you never heard him complain when through the decades militants and separatists have been using Kashmiris as a human shield. At least in this case, everybody is safe. Jawans are not being pelted with stones by a mad crowd, which otherwise begs the same army for alms in flood season. The paid stone pelters are safe, which are described as misguided, but otherwise "innocent" youth. The Kashmiri individual is also safe, who is probably one of the same "innocents" caught raising ISIS flags but will be let off with a warning. It's odd but it works. Also, it's not even a regular practice, just some image that the Abdullahs are using which fits their current political position in the valley. What the real take away from this picture is, that there will always be many to speak for Kashmiris, but very few who'd take the pain to see the average Indian jawan posted in Kashmir as an individual, who bleeds too, who has a family waiting for him. For safe city dwelling mainstream media honchos he's just another sucker doing a thankless job, might as well drive an auto rickshaw or sell insurance in Delhi. He's faceless and that's that. Out of sight, out of mind. For the Kashmiri youth, till he's being used by his Islamic brethren in a pointless war which will keep his entire generation backward, it's all right. The shameless azaadi seekers would not stop at using his old mother and toddler son as human shields in jihad. But he won't complain because to him it's a war against the Hindus, which in reality is a war against his own future. It's nothing new, entire terror complex stands behind human shields of women and children. When alive they shield jihadis and when dead, their images feed the liberal bleeding hearts' self destructive fantasies. If the faceless Indian soldier is adapting to the ways of Jihadis and thriving, then good. Abdullahs can cry their eyes out.